How did you spend your spring break? Twenty-one Vance High students spent it learning, “with all possible energy and enthusiasm,” says an observer. Students in the Vance Engineering Academy eagerly received hands-on tech and software lessons via an apprenticeship led by Information Technologies, a University City entrepreneurial IT business, and sponsored by Electrolux. For several hours each day, students learned how to rebuild laptops with new software, set up networks, write code and create apps. Each “graduate” received a restored laptop computer that they had helped to rebuild. Electrolux worked with Informative Technologies, Vance High School Academy of Engineering and University City Partners to develop this Spring Break program as one way to begin addressing the digital divide in University City. The program provides students with an exceptional job apprenticeship and new job skills for the 21st century. 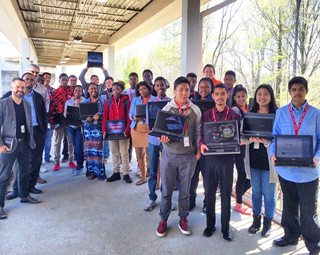 “Our business community provided talent and resources to create this fantastic IT job training internship for Vance High students. We greatly appreciate support from Electrolux, Informative Technologies, Classic Graphics, E2D and Turner Construction,” said Darlene Heater, executive director of University City Partners. A report on the week and a brief student video on creating aps are available on the Engineering Academy website. Informative Technologies, based in UNC Charlotte’s PORTAL Innovation Center, works to narrow that digital divide and reduce electronic waste with the use of its ReviveOS software. The software “revives” seemingly obsolete computers so they once again run well. E2D, a local nonprofit, was founded to answer the question: how can kids do homework and projects successfully if some families are too poor to own computers? Electrolux and Classic Graphics have offices in University Research Park. Turner Construction constructed UNC Charlotte’s EPIC building, home to the university’s engineering programs. “This is a remarkable opportunity for our students to develop marketable technology skills It’s great, too, in that it rewards them from the start with their own laptop computer,” says Matthew Wykoff, Program Coordinator for Vance High School Academy of Engineering. The Vance Academy of Engineering seeks to prepare its students for careers in the STEM fields of science, technology, engineering and math. Along with extensive classroom study, students complete a minimum of 34 hours of work-based learning STEM field experiences with local businesses.